Dual training model, or job education, doesn't fosters only learning: it offers a contribution to the community, in terms of well-trained human resources. In a system of school autonomy, educational institutions have to interpret cognitive needs, social breaks and cultural aspirations of the community in which school works; reason why, the construction of educational processes cannot happen without a trait d’union with the working environment. The education and pedagogical system should completely reflect the contemporary society in which it is integrated, to ensure appropriateformative and socialization processes for younger generations. Clause 4 of the Law n° 53, of the 28 March 2003, introduces, in Italy, a didactics option that provides the opportunity for students to gain experience in a real working environment. 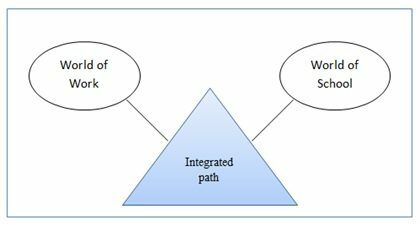 Therefore, school world starts to confer importance to the world of work, to planning and realise integrated pathways of concreate experiences (Fig1). In Italy, Legislative Decree n° 77/2005, also establishes that the student, who has turned fifteen, can earn a vocational qualification; student can reach this title following a full-time school, or opting for an educational program that alternates school lessons and work experiences, in private or state companies. Messaggio pubblicitario Seeing as, education based on experience is necessary for the human being, to coherently adapt to his context, the dual training model becomes an opportunity for social, cultural and educational renewal, both in the high school and in the system of vocational training. Students, followed by business and school mentors, have the opportunity to perform work activities in the company, carrying out tasks related to their course of study. Dual training model, or, as it is defined in Italy, Alternanza scuola-lavoro, is regulated by the Legislative Decree n° 77/2005 (definition of general rules concerning work related learning) and by the D.P.R. (Presidential Decree) n° 87, 88, 89/2010 (Reorganization regulations about vocational schools, technical institutes and high schools) represents, therefore, the connection between school and the world of work; nevertheless, this work experience does not establish a business relationship between student and company. The encounter with the company represents an additional incentive for studying and scholastic commitment; it is a way of learning to find a job, through a strong and targeted professional preparation. The dual training model is a support for pedagogical and didactics action, useful to promote motivation, research ability and for studied argument deepening. In this sense, working reality,including the relationship between individuals, groups, tools and practice communities, gives to the adolescent that learn, the possibility to achieve different levels of expertise, which in turn influence his professional and social identity. Staying in a classroom and staying in a company represent for the student a formative moment for the construction of his identity, through the development of self-assessment competences, in relation to the experience done (Pozzi&Pocaterra, 2007). Messaggio pubblicitario The process of identity construction is characterized by the close connection between self-consciousness and social recognition made by the other, that, in the specific case of the dual training model, for the student is realized through the duty- participation dyad. Duty is the set of tasks and procedures that the student implements to perform his educational experience; participation, however, is the student’s ability to organize his work, including through the group interaction. It is clear that the synergy between duty and participation is the central idea, useful for collaboration and democratic participation (Prilleltensky& Nelson, 2000). Thanks to the synergy between theory (at school) and practice (in a company), continuous processes of cognitive, learning and biopsychosocial transformation are born, in a shared dimension, where all are actors, protagonists and partial directors of the community learning process, as well as their own. 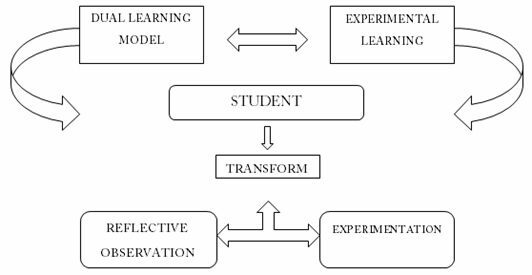 In the dual training model, student reflecting on his own experience, develops forms of self-awareness training and lateral thinking, useful cognitive and social processes to become true knowledge worker. Bertagna, G.(2003). Alternanza scuola lavoro: ipotesi, modelli, strumenti dopo la riforma Moratti. Edizioni Franco Angeli, Milano. Cooley, C.H. (1902). Human nature and the social order. Scribner’s Sons. New York, Chicago. Kolb,D. (1984). Experiential Learning experience as the source of Learning and Development. Prentice Hall, EnglewoodCliffs, NJ. Pozzi, S., Pocaterra R.(2007). Ragazzi sospesi. Un modello territoriale di alternanza scuola-lavoro per la prevenzione della dispersione scolastica. Edizioni Franco Angeli, Milano. Tacconi,G.(2012). La didattica al lavoro. Analisi delle pratiche educative nell’istruzione e formazione professionale. Franco Angeli,Milano.